Levees.org alerted and mobilized state legislators to support HB266 during the 2017 Spring Fiscal Session of the Louisiana Legislature. 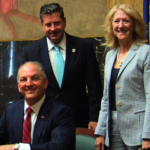 HB266 – sponsored by Rep Patrick Connick, R-Marrero – would require term limits for members of the Southeast Louisiana Flood Protection Authority (SLFPA) Nominating Committee. The campaign, supported throughout the session by Levees.org’s significant membership, was a success. The Senate vote was 37-0 and the House vote was 97-0. 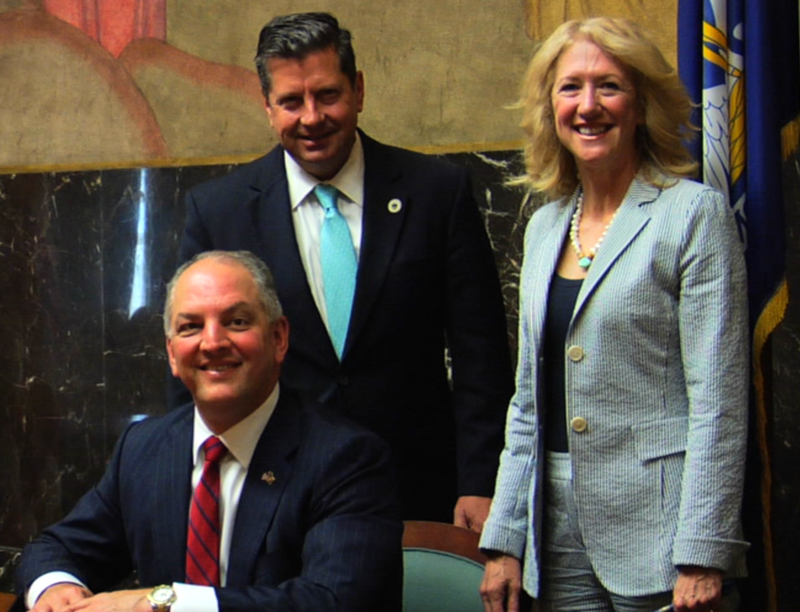 Capping the victory, Levees.org founder Sandy Rosenthal was honored – along with the bill’s sponsor – to be invited by Governor John Bel Edwards to the Capitol Press Room for a special signing. This honor is offered only to proponents of significant legislation. The rationale for the new legislation: Seven weeks after the levee breaches during Hurricane Katrina – with New Orleans still underwater – a small group of business people had a plan crafted and ready. Using full-page newspaper ads and media for purchase, the group quickly convinced a traumatized populace that it needed to reorganize the local levee boards. In the chaotic environment of February 2006 – years before levee investigators concluded that the Army Corps of Engineers was responsible for the flooding – the Louisiana legislature approved the reorganization which would require levee board commissioners to oversee and directly influence the Army Corps. But in fact, the two new authorities – the Southeast Louisiana Flood Protection Authority (SLFPA) East and West have no authority to oversee or directly influence the corps. What in fact did happen is the levee board reorganization took control of who gets to award lucrative contracts out of the governor’s hands and gave it to a small group of people. This small group is the SLFPA Nominating Committee and they have their positions for life. There are no term limits. The reorganization allowed this small committee to – at the end of the day – decide who will spend upward of $60 million of taxpayer dollars annually. The following organizations and supporters joined Levees.org in its quest to convince the Louisiana legislature that this reorganization was not good governance.